The phrase “take a walk on the wild side” is quite literal in Botswana. This jewel in the crown of South Africa is the ultimate wildlife destination, offering some of the most astounding natural spectacles you’ll ever lay eyes on. Being the elephant kingdom of the world with over 130,000 elephants (the most anywhere on earth) roaming its fenceless lands, Botswana stands trunk and tusks above most countries for wild experiences. Whether its exploring the vast grassy plains of the Okavango Delta, staring in awe at the sheer quantity of the wildlife in the Chobe National Park in Savuti and observing nature’s greatest predators, or simply watching the friendly wildlife come to you in a tented camp in one of the game reserves, where it’s possible to have giraffes amongst other marvellous creatures wandering nearby or even through the middle of the camp. One thing’s for certain in Botswana, you’re not going to meet any crowds, its off the beaten track level is one Bear Grylls would be proud off. So get your pith helmet, your binoculars and your zoom lens ready, it’s time for an adventure. The main destination in Botswana and the newest UNESCO world heritage site in the country. It’s known for its vast grassy plains, which flood seasonally, becoming a lush animal habitat. 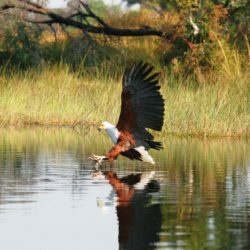 Within the delta is the Moremi Game Reserve, one of the best places to view the spectacular wildlife in Botswana, Moremi covers most of the delta, occupying the east and central areas of the region. On dry land, wildlife includes lions, leopards, giraffes and rhinos. 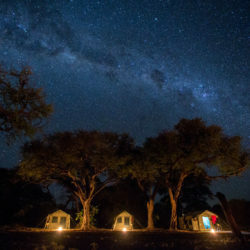 A truly unique experience for anyone visiting Botswana whether it’s the first or 50th time. 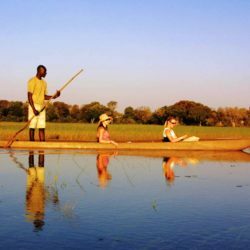 It’s a traditional experience that uses the trunk of the famous sausage tree to make a canoe to then be used on the channels of Okavango Delta. Savuit is a super exclusive destination with only three camps, you rarely spot another tourist here. Within Savuti is the Chobe National Park, the elephant kingdom of Botswana and the world, with more than 100,000 elephants, if you want to see elephants make your way to Chobe, it’s possible to see hundreds of elephants all together at once in their natural habitat. It’s also a brilliant place to spot nature’s greatest predators on the hunt. The salt pans in northern Botswana are among the biggest of its kind on earth. One of the most stunning experiences in the country, heading out onto the Salt Pans to sleep out and gaze at the stars really is magical. July – Sept is the peak season as it’s dry season but there’s floods that arrive from the delta in Angola at the same time. So there’s loads of water, meaning you can navigate the terrain a lot easier and the water obviously attracts tons of wildlife. But it does get busy around this time. Oct – Dec the humidity peaks during these months so it does get really hot (up to 40 degrees). In October, the wildlife does start to disperse a little bit in anticipation of the rain. Late November, early December is when the rain starts to return, so it’s a great time for game viewing (as good as August), and not as busy as the peak season. Jan-Feb is rainy season and few people do come at this time because they don’t want to get caught in the rain, but the showers only last around 20 minutes so it’s not too bad at all. During this time, the landscape becomes really beautiful and really green. It’s also birthing season, so there’s loads of little cubs and calves running around. Don’t self drive – the terrain in the national parks in Botswana compared to other countries’ national parks is completely different, they are made up of sand tracks. So unless you have experience of driving a 4×4 on sand tracks, I’d get a guide to drive you. Also the parks aren’t mapped so it’s really easy to get lost! Get a guide – not only do you see so much more than you would on your own. A guide can get everything sorted for you, in terms of passes, permits, getting through borders etc. Plan your itinerary – have an idea of what you want to do before you come, you don’t want to waste time when there’s so much to see!